﻿ MATERIAL│Selling home appliances・electronic appliances・Design fabricationAIKO SYSTEM Co.,Ltd. MATERIAL│Selling home appliances・electronic appliances・Design fabricationAIKO SYSTEM Co.,Ltd. “Power” is the heat generated inside a conductor due to electrical resistance when current flows through the conductor. The formula expressing the quantity of heat is shown on the right. “Joule heat” is the quantity of work that the current performs in a specified unit of time. Ohm’s law states that the strength of a current flowing through a conductor between two points is directly proportional to the potential difference across the two points, and inversely proportional to the resistance between those two points. 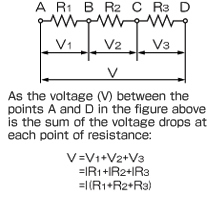 As the current meeting points of serially-connected resistance is the same at each point, if you assume a voltage drop for each point of resistance of V1, V2 and V3 and take theflowing current as I (A), V1 = IR1, V2 = IR2 and V3 = IR3 so the combined resistance (R) is shown by R = R1 + R2 + R3. 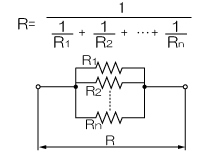 The combined resistance R (ohms) in the case where all of the points of resistance R1, R2 … Rn (ohms) are connected in parallel is expressed using the formula shown on the right. A three-phase AC circuit is an electrical circuit where 3 alternating currents of equal size and frequency pass at phases shifted successively by 120º.